Saturday, August 12, 2017 at 10:40 am. Exactly 43 years since I first laid eyes on the pages of the BOOK. That first impact with the power of such unknown might cost me my mental ability for three long days. My mind snapped with such impact. Indeed! It was feared I was not to recuperate from such blow, but! Three days later? I came back if only with a healthy respect for the Mighty Power in that BOOK. A power I knew nothing about. I shelved the BOOK and made up my mind to dedicate myself to the task at hand to take care of my girls. Even so, the Might of that BOOK cannot be shelved by any other power whatsoever on or below or above the earth. So, my destiny began to shape up as per the Might in that BOOK. Yes indeed! Each one of us are the object of the beauty and passionate undying love displayed in in the pages of that BOOK. And that beauty and passionate undying love are daily displayed in the pages of our hearts in the course of our earthly journey. We are at the portal of the end time, but! As civilization demands we choose to ignore such negative reality. Why should we pay mind to such? Civilization has reached its highest and climbing even farther. There is hardly anything that the human mind cannot achieve, yet! We keep searching, searching, searching…whatever for? Ah! 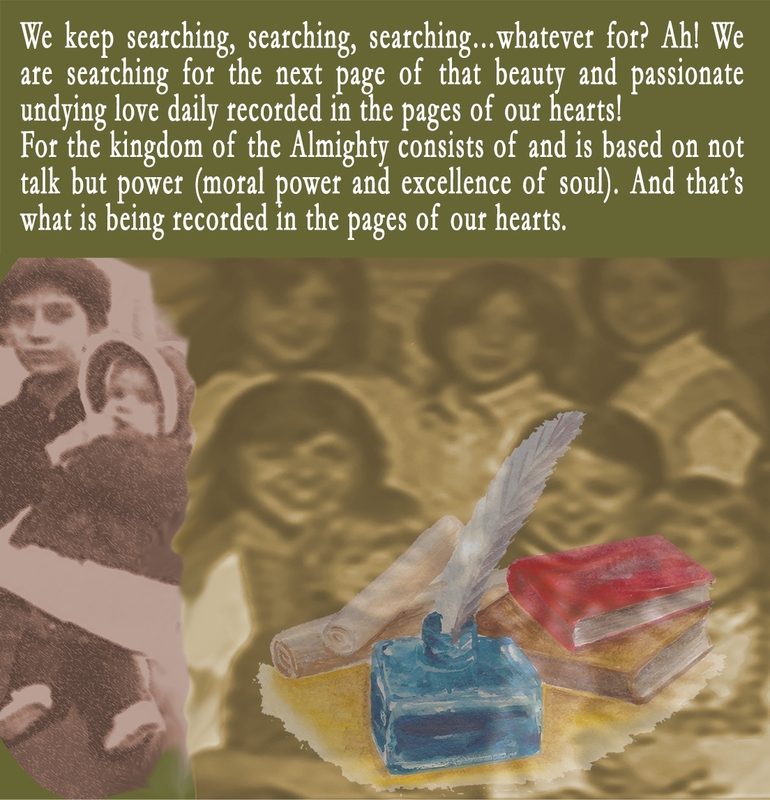 We are searching for the next page of that beauty and passionate undying love daily recorded in the pages of our hearts! Have you found that page yet my friend? Are you able to identify the pages in your heart by reading the pages written in the BOOK and in the heart of yours truly recorded in the journal of my life? For the kingdom of the Almighty consists of and is based on not talk but power (moral power and excellence of soul). And that’s what is being recorded in the pages of our hearts.